Scheduled for 7 pm on November 27, 2014, the free event draws several thousand people, but you can watch it perfectly from the large parking lot. It will be a very busy visitor day inside the museum, so if you’re thinking of taking a tour you should book ahead. If you’ve never visited the Titanic at Pigeon Forge, it’s a class act that offers a tremendous education of the period and the events of the Titanic tragedy, in countless ways actually creating the real feel of the great ocean liner. During this Christmas season, the ship is lit up brightly inside and out with thousands of lights and period-style decorations. The Titanic staff, officers and crew are dressed in the costume of the time, and even Santa is dressed from the period. 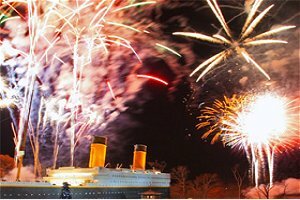 Expect to see Santa during the snowfall on Thursday evening, and on every Saturday through December, when the Titanic will provide its weekly magic snowfall for us. Fireworks is not usually a Thanksgiving event, but when did the Pigeon Forge and Gatlinburg area ever shy away from the chance for a bold spectacle? Already millions of lights are twinkling – and even dancing to music – across the area. All that’s missing is a huge fireworks display to turn the night sky alight with color and excitement. Fixed. One thing for sure: after Thursday evening’s show, Christmas season has begun. The following day, the extensive gift shop on board the Titanic Museum will fall in with Black Friday tradition and offer a myriad of gift items on sale, if you’re planning to go shopping on that day. There will be a Cyber Monday sale on the web site too. 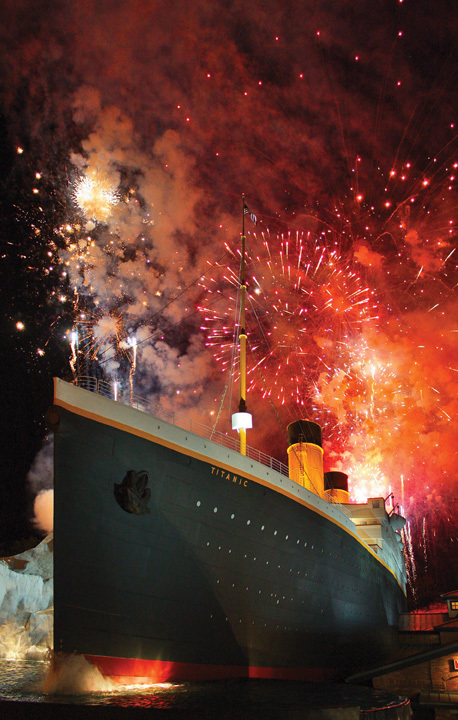 Again, it’s worth remembering how popular the Titanic Museum is – the attraction has received more than 2 million visitors since it opened in Pigeon Forge in 2010. 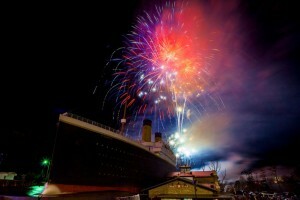 If you plan to come for a tour, check the web site at www.titanicpigeonforge.com, where you can also buy tickets. If in doubt call over first at 1-800-381-7670. The Titanic is located at the north end of Pigeon Forge on Parkway between Lights #0 and #1. If you’re driving north, pass Light #1 and look for a big old steamship ahead!